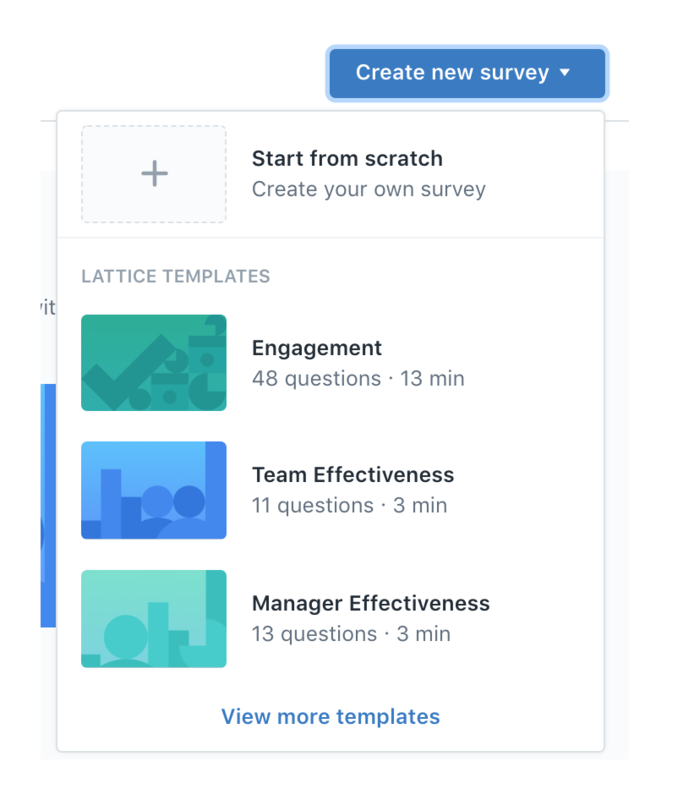 Lattice now offers survey templates you can use when setting up your survey! The questions in these templates were developed in partnership with the University of California, Berkeley social sciences department. All questions are rated on a Likert scale (strongly disagree, disagree, neutral, agree, and strong agree) unless otherwise noted. To use any of these templates, navigate to Surveys from the Admin Panel and click on "Create new survey." From the drop-down menu, you will able to view all of the templates we offer. You will also be able to create your own survey. Each of our templates focus on a specific theme and measure certain attributes: engagement, team effectiveness, diversity and inclusion, and manager effectiveness. This survey is designed to give companies a broad understanding of the factors that drive employee engagement. What does this engagement survey measure? The questions this survey asks can be found here. As more work is done by teams, it's important to make sure that teams within your organization are performing at its best. This survey is designed to assess how safe people feel taking risks on a team, as well as how effectively the team learns and improves as a whole. What does this team effectiveness survey measure? Having a diverse and inclusive culture is critical for companies that want to grow and thrive in the modern business environment. This survey is designed to give companies a sense for how people feel around the diversity level of an organization, but also takes it a step further to probe around how included people feel within the environment. What does this diversity and inclusion survey measure? Managers have a massive impact on the engagement and retention of their direct reports. This survey does a check on how people are feeling about their managers across all fronts. What does this manager effectiveness survey measure? If you have any other questions about surveys, check out our help center.